Clinging to the edge of the limestone bluff stands a building that looks to be well over a century old. The wooden planks of its front wall stand crooked and slanted as over time they have grown tired and decided to lean on one another for a little rest. The tin roof is peeling and covered with Virginia Creeper that turns a bright red every fall season. For years, as I’ve walked past this old building I have wondered how long it has been standing there, and how many memories are contained within its three remaining walls. Beneath the floor, visible through the holes in the wood, is an aged metal water tank sitting conveniently next to a wet-weather spring. At the bottom of the cliff just above the river is an equally ancient structure not much larger than a doghouse that served as a pump house. At times of year when the spring wasn’t running, water could be pumped up to the storage tank above. Over the years working at Lost River Cave I have heard many questions about that building as well as numerous theories as to how that building may have been used. A common answer is that that building was the honeymoon suite. There was a tourist court operating at Lost River Cave during the 1930’s through the 1950’s featuring several cabins that visitors could rent and spend the night. This particular building is larger and constructed differently than the standard cabins were. It has multiple rooms, and was the only one with water. The idea of this being a “deluxe” version of the accommodations at Lost River Cave is a realistic idea, and it has been reported as such by visitors who have been here in the old days. The second theory I have heard, and this one was speculation based on the structure of the building, is that this building might have been something along the lines of a general store for use by those staying at the tourist court. This idea was proposed by a guest on one of my tours that had a hobby involving old buildings and their uses. He said that the size and shape of the front window led him to believe that customers were once served from that window. The story I heard thirteen years ago, is the one I personally like to rely on the most. It was the first year that we were open for the winter. That year winter was an incredibly slow season for Lost River Cave business. Over the winter, we averaged about six people over the weekends, and zero people throughout the week. I spent a lot of time trying to find ways to spend my time that season. Usually on Saturday, I would be the only person on staff. I would come in, get the cave and boats ready for any tours that might run, then head up and open the gift shop. As the Friday closer usually had plenty of free time too, the visitor center was always clean and ready to go when I showed up. I would double check that the gift shop was ready, get the cash register ready, and open up for business. Around 11:30 or 12:00 I would take a lunch break, putting a sign on the window letting people know when I would be back. Every once in a while, usually after lunch, someone would come in for a tour. This day, the people that came in were not interested in a tour of the cave, instead they were giving each other a tour of the house that had become our gift shop. I knew that I had a great resource on my hands, so I started asking them questions. It turned out, not only did they once live in the building, but their parents owned and operated Lost River Cave back in the old days. Among the other questions, I asked about that old run down building. She told me that when she was young, she worked at Lost River Walnut Company and that she sat in that very building husking walnuts. Lost River Walnut Company would collect walnuts from the numerous black walnut trees that grew in the Lost River Cave Valley and would also buy walnuts brought in by locals. The walnuts had a number of uses. Not only are they a healthy nut to eat, but the husks have been used to produce dyes, inks, and stains. Iodine can be extracted from the hulls, and the shells, when pulverized, were used to stuff teddy bears and pillows. So, with three stories, the question still remains, what exactly was that building used for. My best answer is that it could have very well been used as all of the above at different times. This would explain why visitors who had been here at different times in the past remember it for different purposes. Winter bird feeding is in full swing in the Lost River Valley. Feeding wild birds in your back yard in the winter is not only a great opportunity to watch them from a comfortable setting, but can enhance their habitat during the sparse season. The lush berries and seed laden vegetation of fall have withered and blown away and most insects are either dead or dormant. Providing food for the birds can help them obtain the energy they need. This quick tutorial about birds and feeders can help you get started. As a winter bird feeder, I enjoy seeing my feathered friends that visit during the cold months. The Chickadee, Nuthatch, Titmouse, and Junco come back each winter to the same feeders. They let me know if they arrive before I start putting out the seed (or if I ever let any feeder get empty!). Year round my visitors include the Downey, Hairy, and Red-Bellied Woodpeckers, Cardinals, Blue Birds and Mourning Doves. On occasion I am blessed by a Palliated Woodpecker, Brown Creeper and even a Wild Turkey. Adding a never-before-visiting species is a highlight of my back yard feeder guestbook. There are many ways to feed, some feeders serve a specific species, and others work for a wide variety of birds. 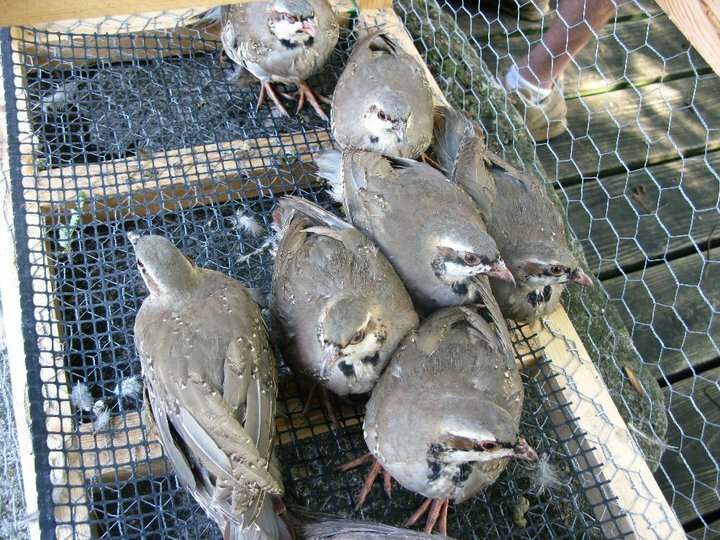 Platform feeders serve a number of species, but are not a good way to keep the rain and snow from your seed in the winter time. 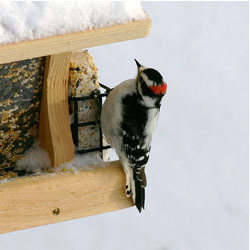 Chalet and Hopper feeders are great for a wide array of birds and keep the seed covered. Chalet feeders that have “U” shaped perches provide more landing area. Hopper feeders offer the space needed for larger species, such as plump Cardinals, to stand and feed. 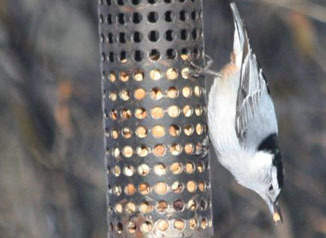 Tube feeders work great for smaller species, such as the Titmouse and Chickadee. 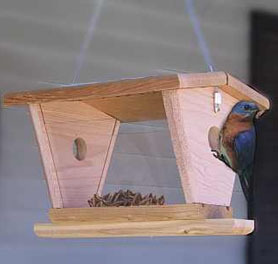 Bluebird feeders utilize an enclosed platform feeder style with limited access. Most every type of feeder can be purchased in a squirrel proof design or at the least, adding a baffle can help deter the squirrels. My set up is very minimal with a few hopper feeders with attached suet feeders, and a finch feeder or two. In the spring, summer and fall, birds’ diets consist of insects and plants to meet their nutritional needs. When choosing winter food it is important to understand what they need to eat to stay healthy and try to supplement their diet by offering the proper type of nourishment. Doing so will reward you with birds of many shapes, colors and sizes. Suet is a great high energy food used to maintain the metabolism of insect eating birds. The Woodpeckers will go crazy over it. Try different brands, you’ll soon learn which ones your locals prefer. Peanuts provide protein and are another great way to keep the woodpeckers and other insect eaters. Black oil Sunflower seeds are a great source of protein and fat and serve a broad number of birds. Nyjer seed is the best way to attract the House Finches and Goldfinches. Certain tube feeders can convert from dispensing Nyjer feed to mixed seed and sunflowers with a simple rotation of the feed opening. Mixed seed is great to attract a wide variety of birds, especially if you get a mix that contains fruits and berries. However, this can be quite pricey. I usually mix a small bag of fruit mix in a larger bag of a basic mix. This is more affordable and keeps the fruit and berry lover coming back. This mix is also great for the ground feeders, such as the Juncos and Doves. Meal worms or Bluebird Nuggets are great for the Bluebirds and provide their metabolism with the protein they need. Fresh Fruits, such as oranges, apples, and grapes, as well as jams and jellies are a treat to many species. Don’t forget to watch them! Keeping a pair of binoculars and a bird ID guide near the door or window with a view of your feeders is a great way to enjoy the fruits of your labor. I suggest the Birds of Kentucky field guide by Stan Tekiela; it is a great beginner guide for identifying the birds seen commonly in your yard. Keeping a guestbook journal is a great way of tracking your many visitors. Have fun! Visit the Lost River Trails to see the feeder set-ups we have and then stop by Wildflower Gifts to take advantage of the great feeder selection and prices we offer to get started in your yard today. It’s time to root out and destroy pesky plant invaders with at the 8th Annual Invasive Plant Pull! 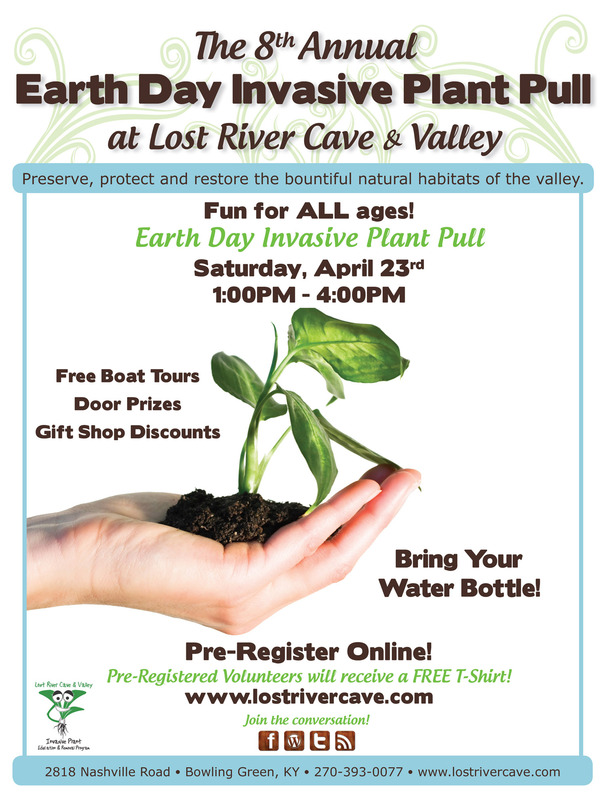 In celebration of Earth Day, Lost River Cave and Valley invites you to spend an afternoon to help re-invigorate the valley floor, on Saturday, April, 23th from 1:00PM – 4:00PM. Bring your entire family and join other community members as they band together in an attempt to eradicate invasive plants from the Lost River Valley. Pre-register so we can plan a plant plot for you to help pull pesky plants from the valley. Early-bird registrants will receive free Invasive Plant Pull t-shirts, Free Boat Tours, Door Prizes, and Gift Shop Discounts. Volunteers can pre-register by visiting us online at http://www.lostrivercave.com to download the application. Applications can also be picked up at Lost River Cave and Valley located at 2818 Nashville Road in Bowling Green, KY or calling us at 270-393-0077. The Invasive Plant Pull is an annual event at Lost River Cave & Valley offering individuals a chance to gain volunteer experience while teaching you to detect invasive plant species wherever you see them. With your help Lost River will one day be rid of the pesky sprouts that run rampantly over the 25-acre valley floor. Clearing plants like winter creeper and privet is easy work that provides much needed elbow room for our long suffering native plants. Your handiwork will be rewarded when you see that sunshine, rain and nutrients are helping to re-invigorate the forest floor with a carpet of ferns and native flowers that provide food and shelter for the valley’s native and migrating animals. FRIENDS OF LOST RIVER is a 501(c)(3) nonprofit organization. The organization is committed to environmental education, community building, and natural resource preservation. Lost River Cave has been visited by travelers from all over the world who come to experience Kentucky’s Only Underground Boat Tour. Dodging raindrops, staying hydrated, and strengthening ties with the community are how seven Greenview Regional Hospital executives spent their day at Lost River Cave & Valley on Wednesday, July 28th. As part of the annual United Way Day of Caring event, these volunteers worked for over 40 hours towards the completion of a security fence for boats and other equipment that is necessary for the day to day operation of the park. Although a tremendous amount of effort was exerted at today’s activity, the daunting task adopted by the eager volunteers was not completed due to a spontaneous summer thunderstorm. Determined to see the project complete, each altruist offered to return next week to finalize the project. Today’s work consisted of framing and preparing the fence for assembly, prepping the area for use i.e. weeding, removing rocks and debris, and determining specific locations within the area for the boats and equipment. The fencing that is being built is a much needed addition to the park that will keep important equipment safe. We at Lost River Cave & Valley are so grateful to Greenview Regional Hospital for promoting the spirit of volunteerism in Bowling Green. Check back with us next week to see pictures of the finished project!